April 10, 2019 – Image of Clarks Grebe taken at Sandia Springs Wetlands by our very own Ellen Weinacht. This is an uncommon sighting for this area. 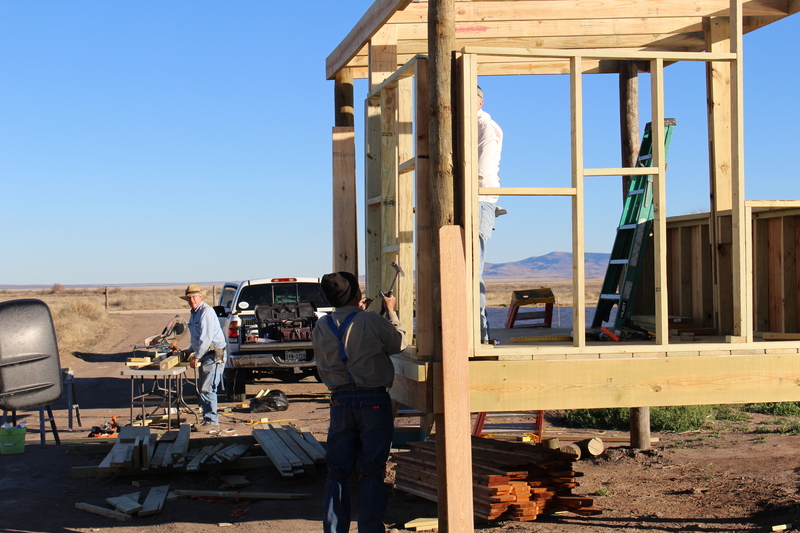 March 13, 2019 – A sampling of the Sandia Springs Wetlands guest registry. If you visit be sure to let us know you were here and of any sightings. February 18, 2019 – Great trip / sighting report from Cecilia Riley. Excellent photos to follow as well. Thank you Cecilia and Mike. Mike and I had a pretty good day yesterday birding the Balmorhea area. Below is the checklist of birds we had at Sandia Wetlands and I have included a few of Mike’s photos from there too. Enjoy! BTW-the ponds are in great shape. Good job on the management effforts. Life is better with birds! Two photos are of a Prairie Merlin. It was camped out in the trees surrounding the field house on road into wetland. Second photo same Prairie Merlin. Cinnamon Teal, male and two females. The Brewer’s Sparrow – kind of drab but still a nice winter bird. 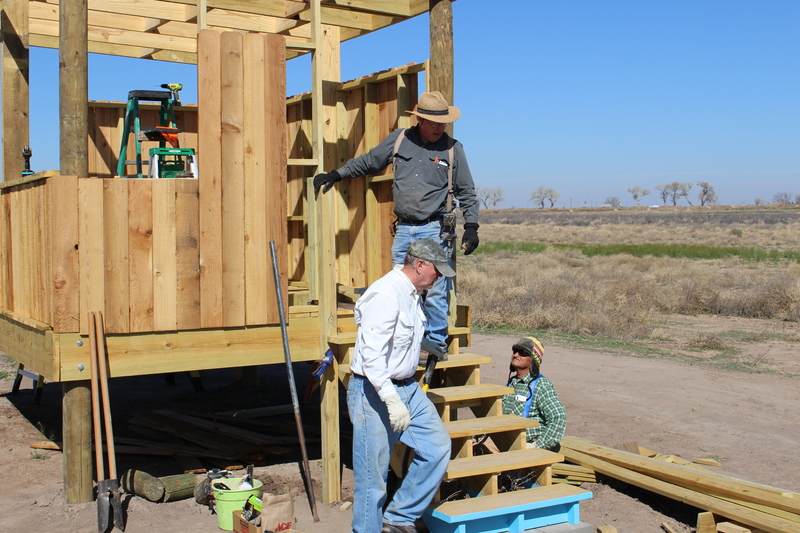 Kay Charter Executive Director Of Saving Birds Thru Habitat; Dave Wilson Sandia Wetlands Project Manager. 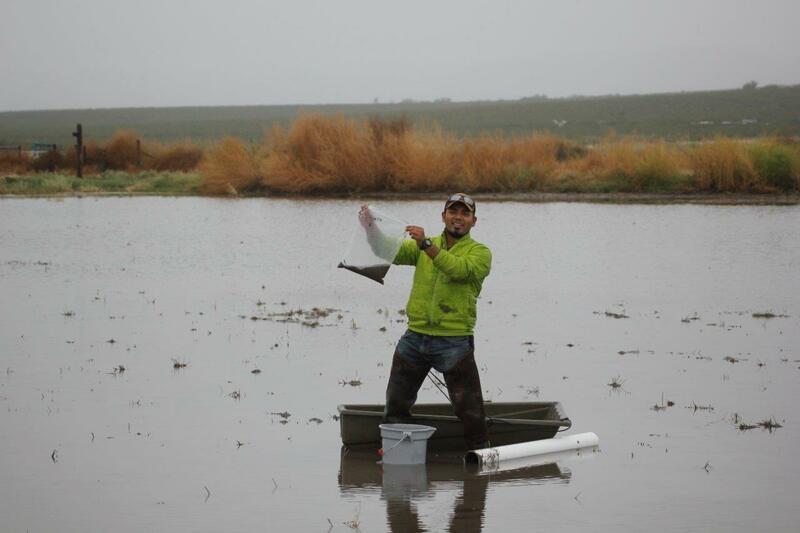 Dr. Lewis Land taking water samples at Sandia Springs Wetlands. The samples must be kept cold. January 4, 2019 – Science Friday segment: “Gaga For Grosbeaks? Coveting Chickadees? Devoted To Ducks?” on birding and the annual Christmas bird count. Worth the listen. December 16, 2018 – Images taken during this past weekend’s Christmas Bird count taken by Michael Gray. Thank you Michael! November 15, 2018 – Following is a detailed sighting report from Cecilia Riley who visited Sandia on November 14th. Thank you Cecilia and we urge all visitors to report their sightings via app or email to ellen.weinacht@gmail.com or list them at our Sandia Wetland Alcove guest book. 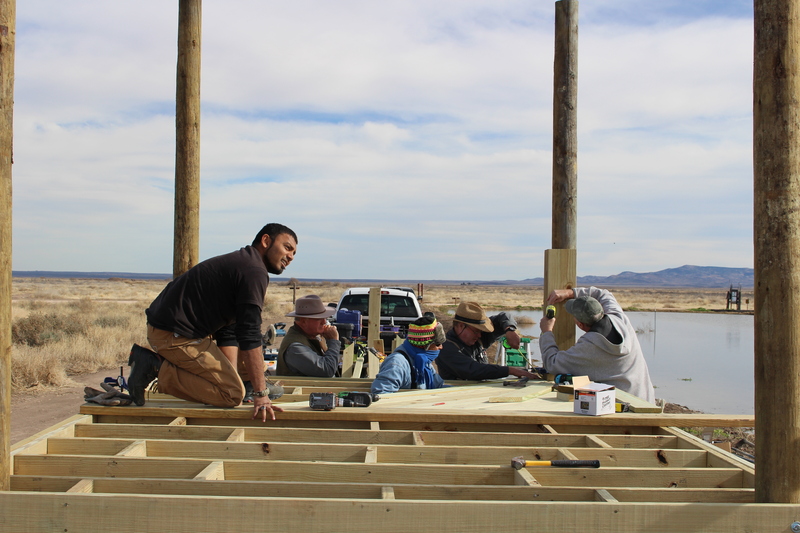 October 3, 2018 – Sandia Wetlands Project is regularly used as a study or research site and we are delighted to have these activities. Following are images taken during a transect plant survey. 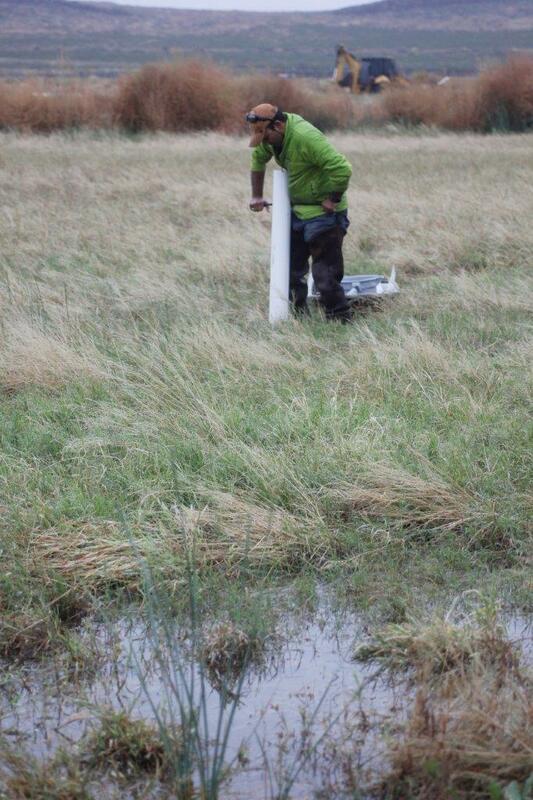 The purpose of the study is to compare how previous / current land use affects wetland restoration efforts. This is to accurately assess the health and layout of each wetland, suggest future restoration efforts, contribute to long term water quality monitoring and encourage other landowners to consider similar water management projects. September 29, 2018 – Dave Mainz shown here at Balmorhea State Park giving a wetlands ecology lecture to Tierra Grande’s new Member Class of 2018. 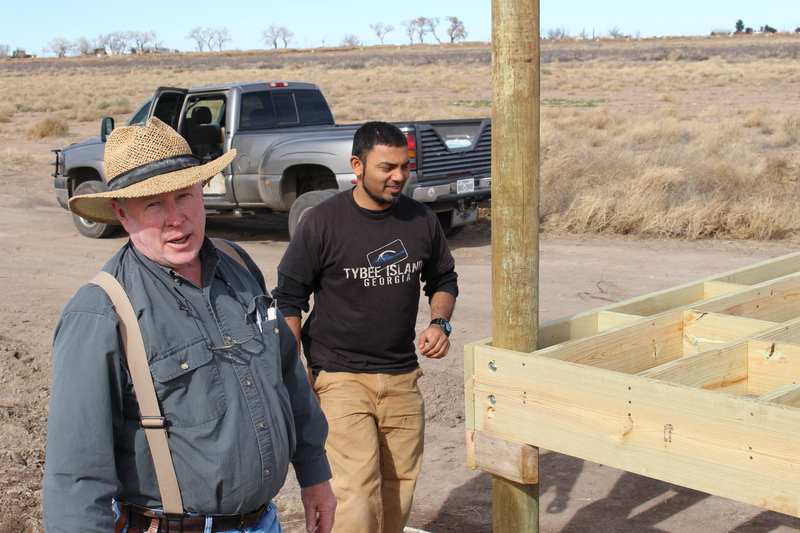 Dave is a Tierra Grande charter member (Class of 2005) Master Naturalist and long time supporter, and volunteer at Sandia Wetlands Project. “Coming Soon” To Sandia, on November 14th: The Alpine Gardening Club! Welcome! We look forward to their visit. 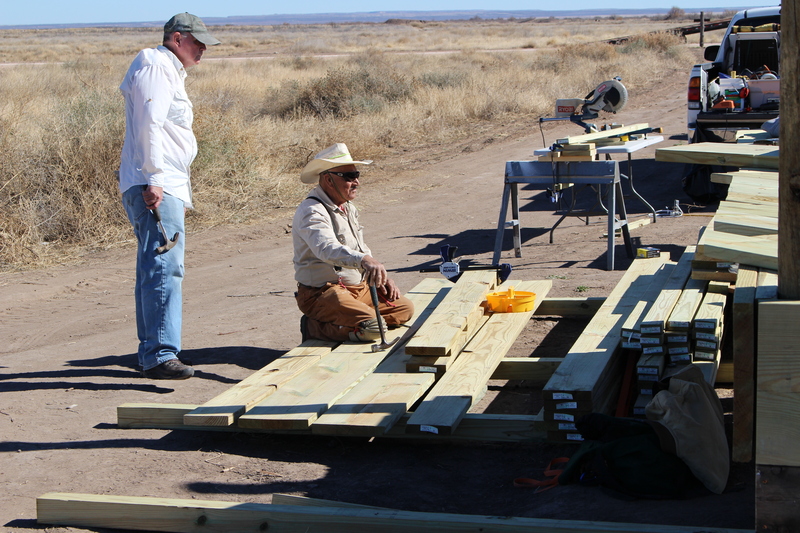 August 20, 2018 – Chris Wilson (left), Sandia Project Manager and Dave Mainz upgraded the flooring of the Dragonfly Pond bridge for this weekend’s Hummingbird Festival. July 11, 2018 – Annual maintenance. Next step fill with water. July 4, 2018 – New signage marking the location of Sandia Wetlands on Highway 17 either side of Reeves County Road (CR 313). It is now even easier to find us. Come visit! 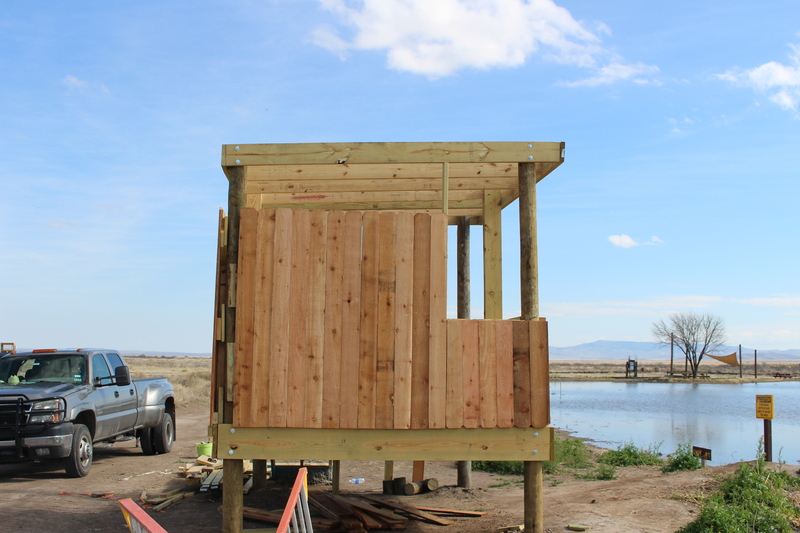 For map and directions to Sandia Wetlands see our “Visit” tab above. July 3, 2018 – Some great images shared with us by Gaylon Wampler. Thank you Gaylon! June 20, 2018 – With increased drilling and exploration in the region ongoing research of underground water quality will be undertaken by hydrogeologists with the UT Austin Bureau of Economic Geology (BEG). For detailed information see our “Research” tab (above). June 20, 2018 – Year to date posts to our “Sightings, Visitors” tab (above) have been made. We are pleased to see visitorship continues it’s upward trend over prior years. Friday June 8, 2018 – Water was shut off to Unit #2 @ 1 pm for annual maintenance. We are using sand bags this time. 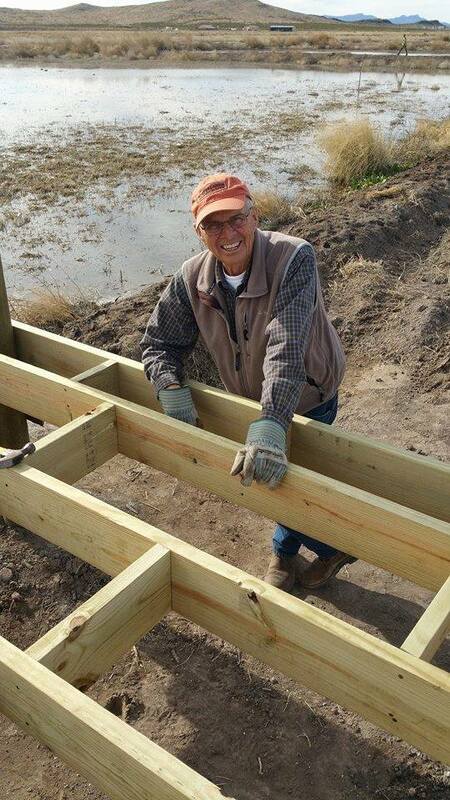 April 5th we lost Dave Hedges to cancer and neuromuscular disease. 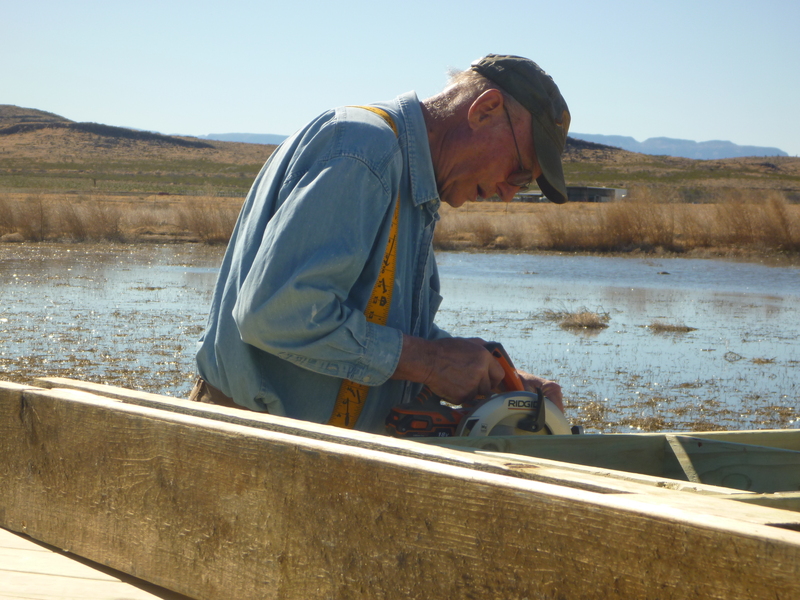 Dave was a great friend in many ways and Project Manager for Sandia Springs Wetlands. Dave was there for us in the beginning when Sandia was just an inspired idea through to what it has become today. We could not have done it without him. 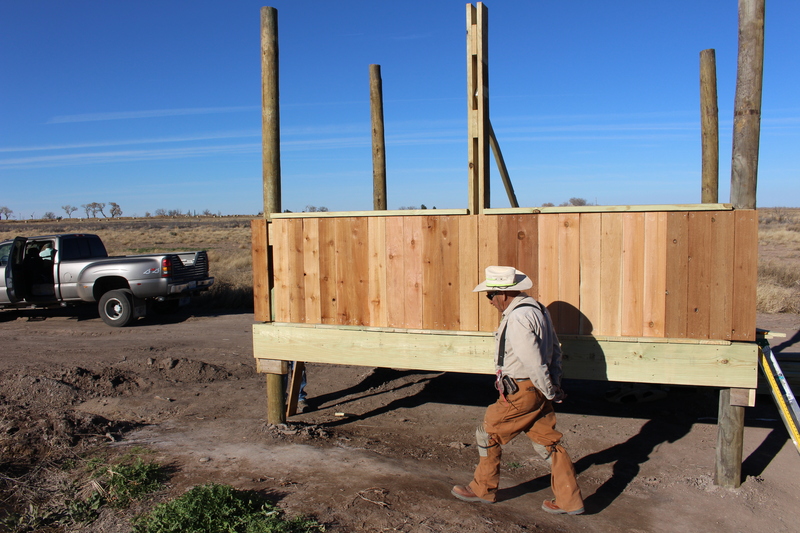 Dave Hedges installing one of new two new irrigation gates. Congratulations Harry and Hallie. Please come see us again. February 20, 2018 – Sandia as a research site has been part of larger studies on the part of Borderland Research Institute, Sul Ross and other institutions. Soon we will welcome Anna Elisa Pina, Phd student from the University of Texas at El Paso. As part of her thesis Anna will be surveying wetlands in the desert Southwest including Sandia for macro invertebrate communities and water quality. Welcome Anna! Go Miners! 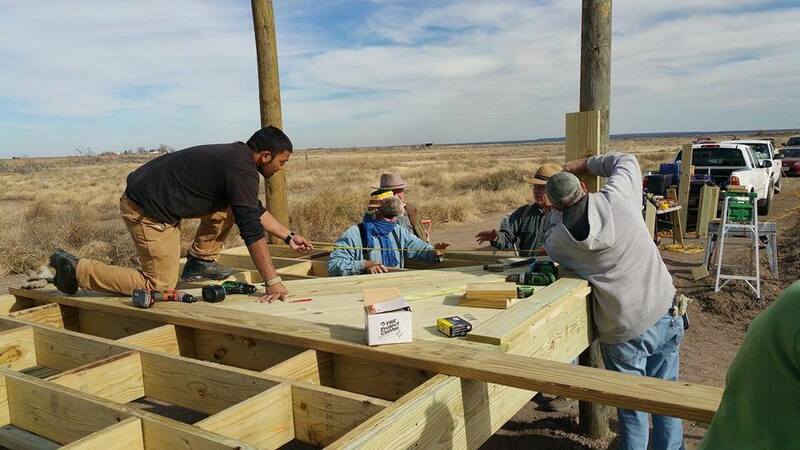 February 20, 2018 – Busy times at Sandia Springs Wetlands. Thinking of visiting? Directions and map under the “Visit” tab. We would love to have you. 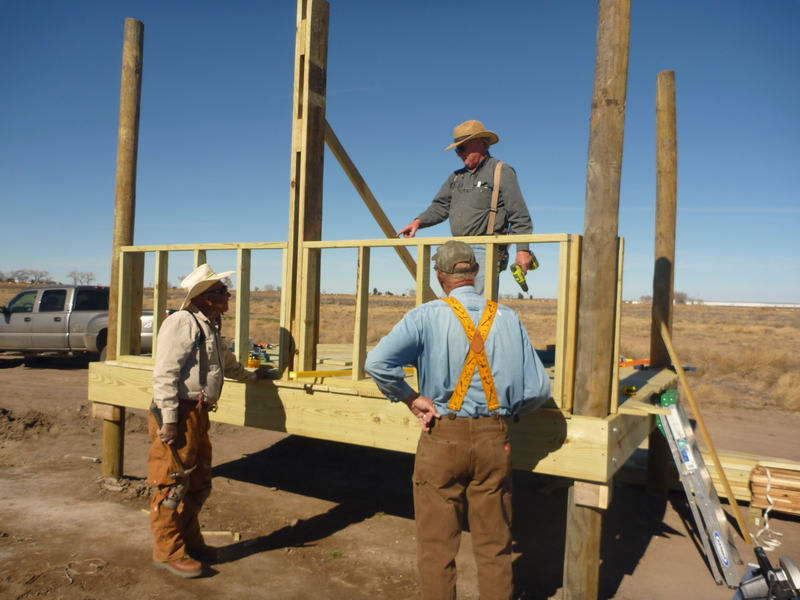 February 8, 2018 – Sign dedicated to Dave Hedges – Sandia Project Manager, Dave Mainz and Michael Carter. Metal Art Kiosk created by Diane Billingsley, (purpleanvil.com) designed by Linda Duncan. Alligator Juniper logs donated by the Natural Conservancy, Davis Mountains Preserve. February 3, 2018 – Michael Gray images from his and Cecilia’s recent visit to Sandia. Thank you Michael for sharing! February 2, 2018 – Texas Parks & Wildlife recently aired a TV segment titled “Wetlands For Birds”. 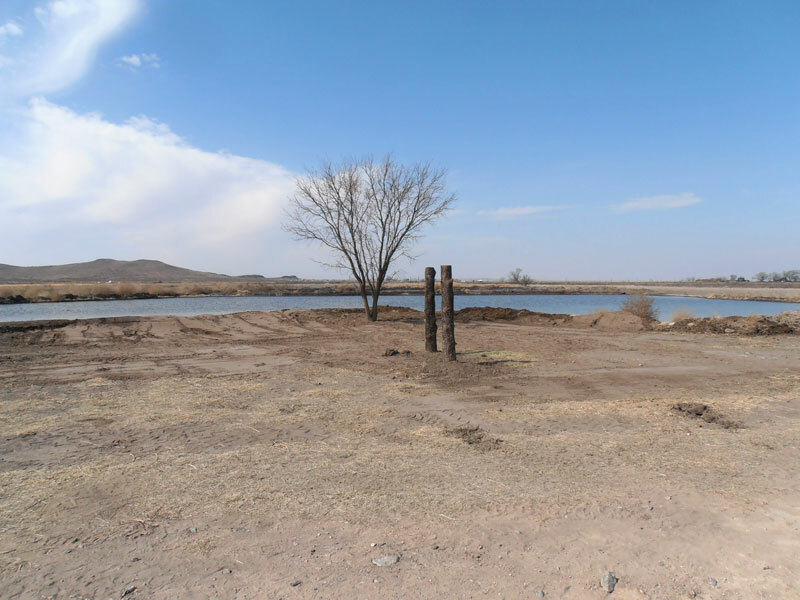 Included were West Texas Wetlands in the driest region of Texas, and the ingenious landowners who created their own desert oasis. 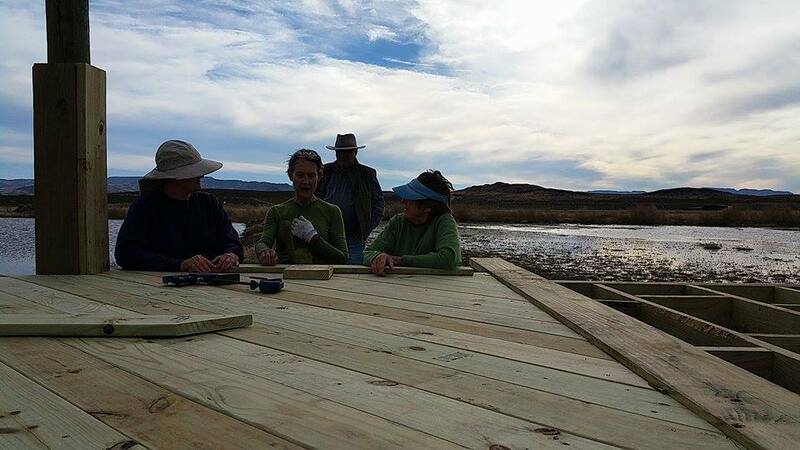 Featured is Sandia Wetlands, Balmorea and our very own Ellen Weinacht landowner and inspiration behind Sandia; Christmas Mountains Oasis – South Brewster County; and the B. J. Bishop Wetland – Presidio County. The segment follows is very well done and worth the watch. Enjoy! January 23, 2018 – Happy New Year Y’all! Controlled burns were conducted this week to remove encroaching and invasive plants. All four ponds should be up and running by week’s end. Cattails have been planted in our Dragonfly pond. Looking forward to spring. Come and enjoy Sandia Springs, directions under the “visit” tab above. November 11, 2017 – The Snow Geese Are Back! Come See Them, Bring The Family. Snow Geese At Sandia Wetlands Project. October 15, 2017 – This Time Of Year Sandia Wetlands Is Popular With Ducks & Geese. A Lift Off Of Ducks Shown In The Video. Come Visit! – A Map Of Our Location Is Under The “Visit” Tab Above. Sept 23, 2017 – Seasonal Transition Of Wetlands For Ducks and Geese. Shown: Unit 3 Mowed and Being Refilled. 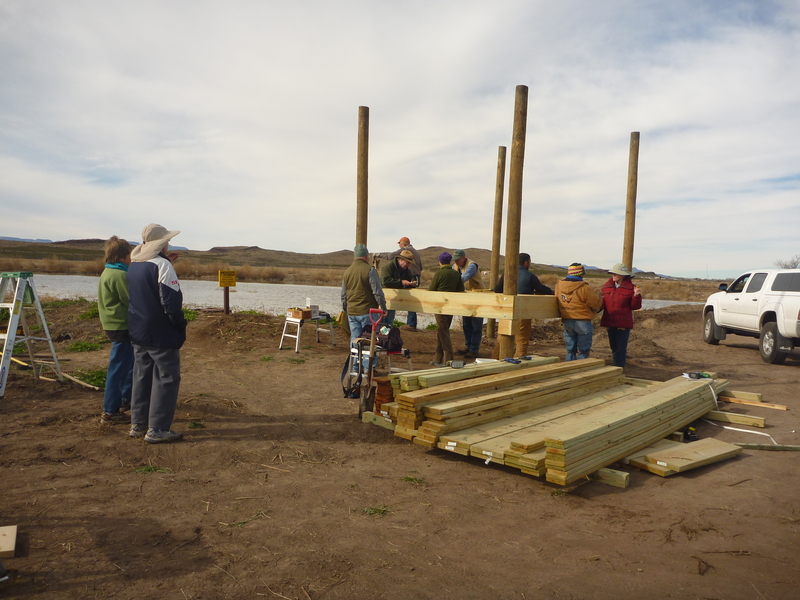 August 10, 2017 – Tierra Grand Class of 2017 Members Are “Hands On” with Wetlands Maintenance & Fall Cleanup. Thank You Texas Master Naturalists One and All! June 3, 2017 – Sightings and images from Sandia Wetlands Project. Thank you Mike and Cecilia Gray! Following image with dark eye (not red) is maybe a Glossy Ibis. The rest are White Faced Ibis. Unconfirmed sighting and images from Mike Gray – May 5, 2017. Thank you Mike! The following images taken by Mark Lockwood, TPWD April 24, 2017. American Golden-Plovers are quite rare in the Trans-Pecos. Thank you Mark! Drone Footage, Sandia Wetlands Project – April 13, 2017. How far we have come in just a few short years. Spring migration is well underway we expect to see you soon. “New Flash” – Herring Gull Sighting March 31, 2017. Reported By Cecilia Riley, Thank You Cecilia! IMAGE COURTESY OF GARY MARTIN. FINISHED VIDEO TO BE RELEASED SOON. 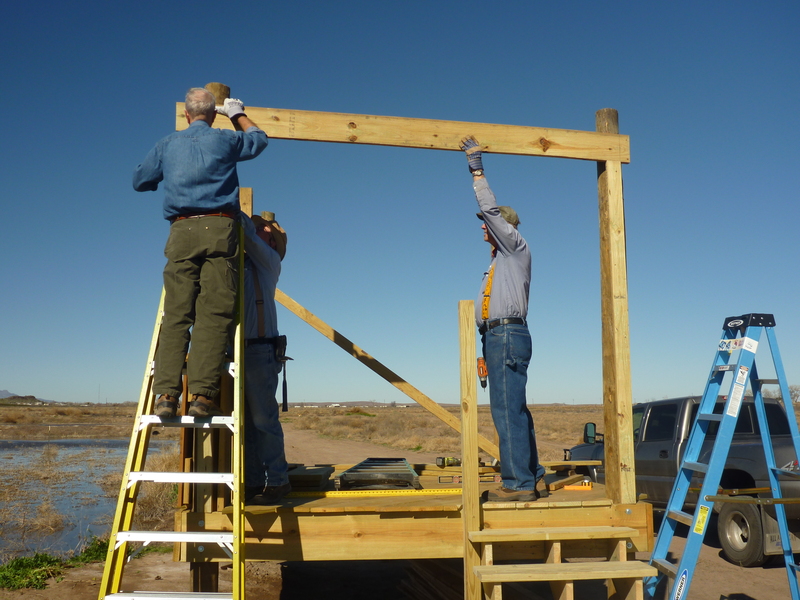 Plotters and planners Kay Charter – Director Saving Birds Thru Habitat, Dave Mainz, Chris Wilson, Gary Martin – President TAMU Press, all plotting and planning for the new dragonfly pond. 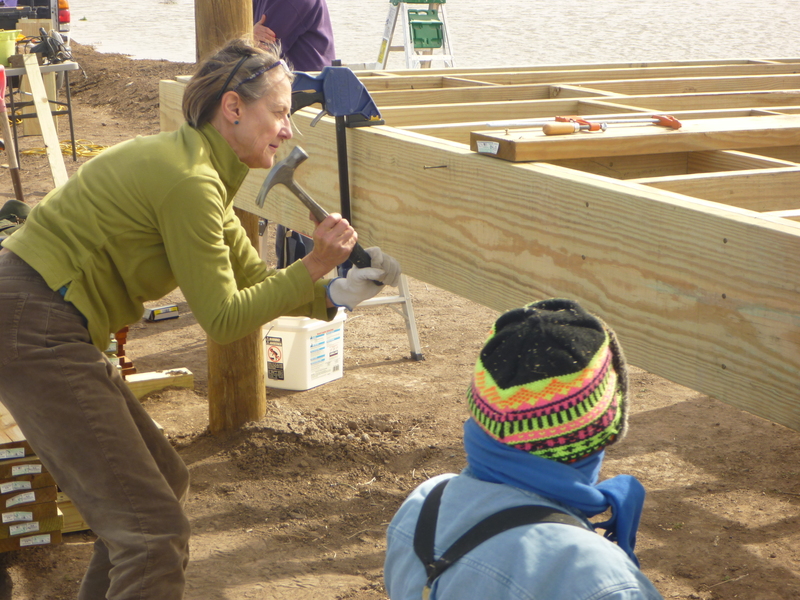 Not shown Ellen Weinacht, Photographer and Sandia Wetlands Project Director. 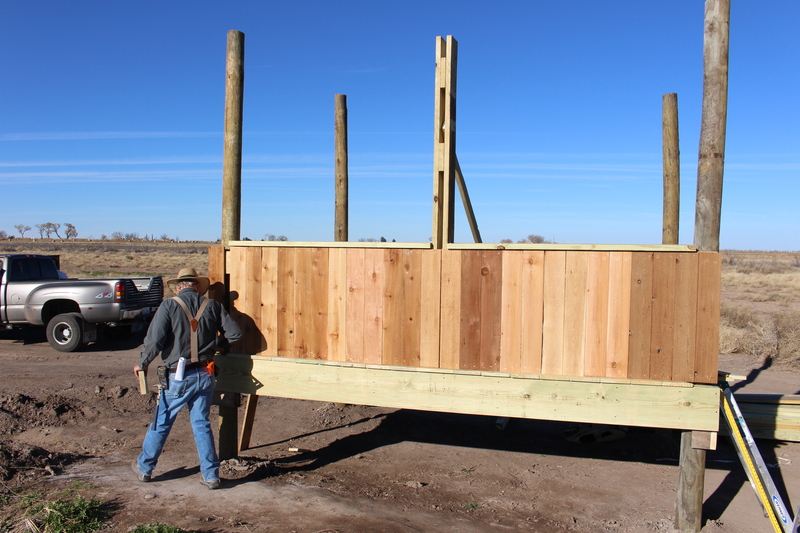 Winter upgrades and improvements have all been completed at Sandia Springs Wetlands. 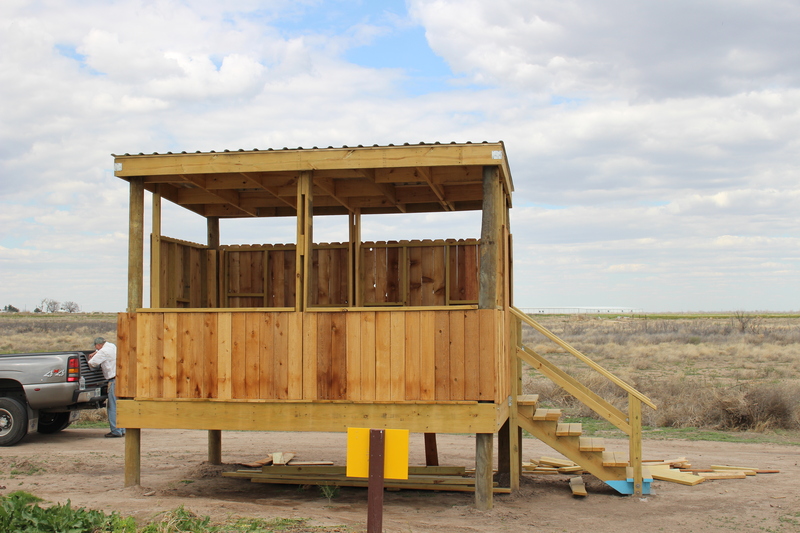 All units have water and we are waiting on spring migration: Bring It On! 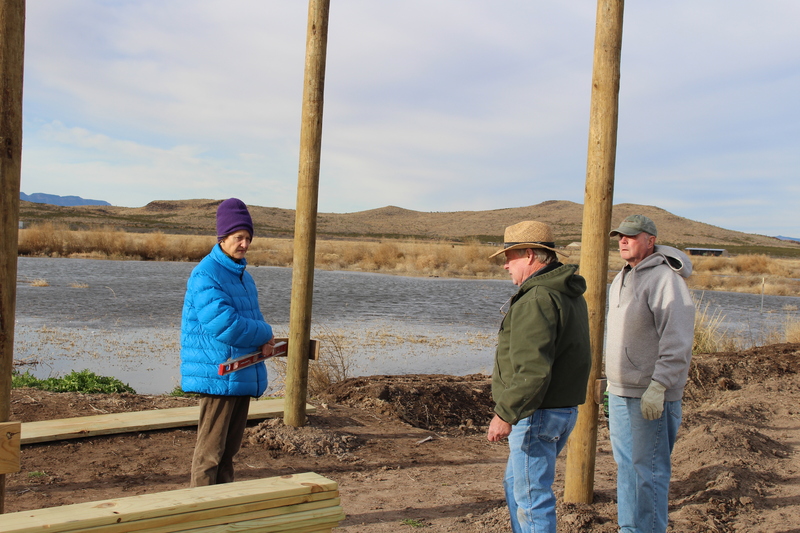 Preparations are underway to ready the wetland for the installation of new gates in ponds 2 and 4 and new drainage pipes in ponds 3 and 1. The pools have been drained and the ducks and geese have made themselves at home in ponds 1 and 2, our overflow ponds. Work must be completed by mid-July. 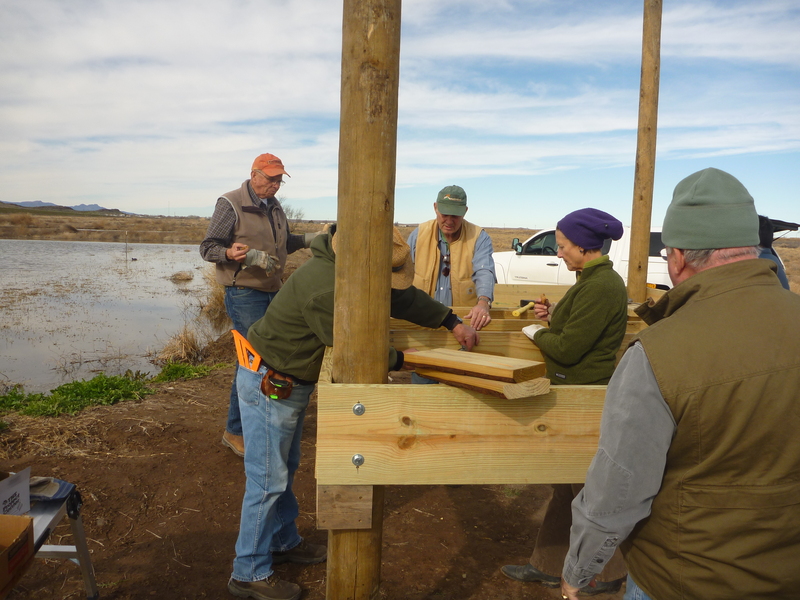 Our thanks again to Ducks Unlimited for their generous grant. The dragonfly pond is nearly off the drawing board and promises to be another exciting adventure. 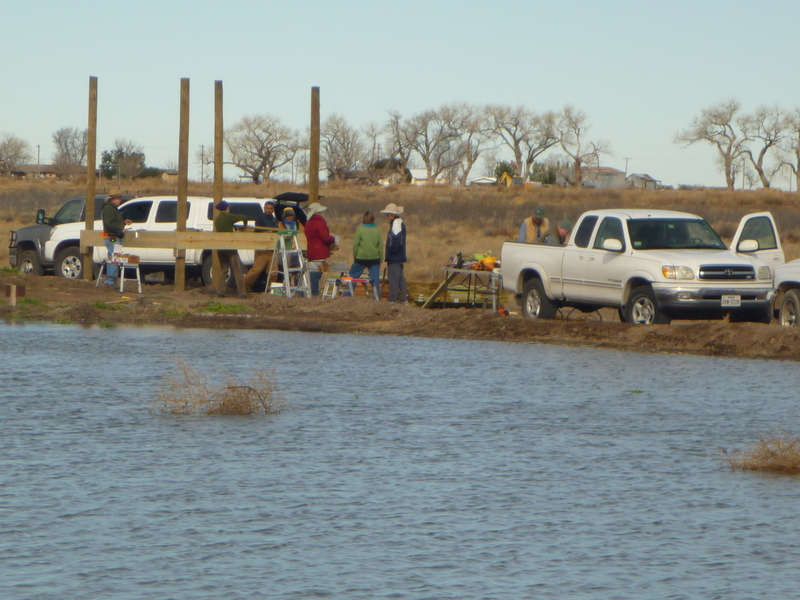 TEXAS MASTER NATURALIST CHAPTER ANNOUNCES RECEIPT OF GENEROUS GRANT FROM DUCKS UNLIMITED TO BENEFIT THE SANDIA SPRINGS WETLAND PROJECT, BALMORHEA TEXAS. 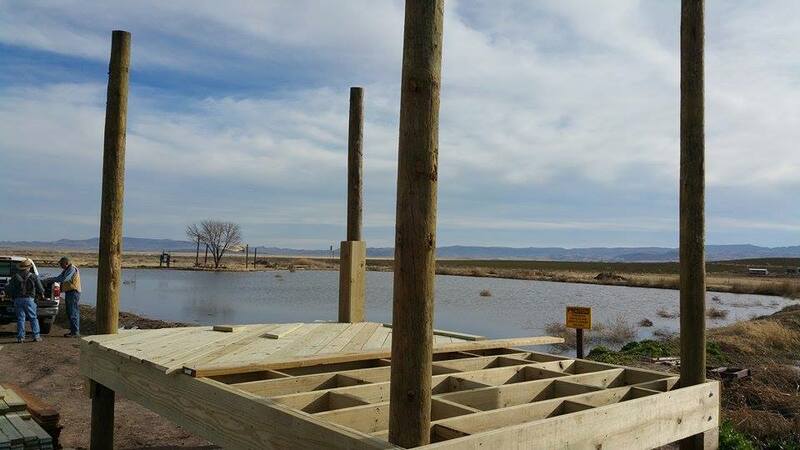 Sandia Springs Wetlands hosted as one of the venues for this event. 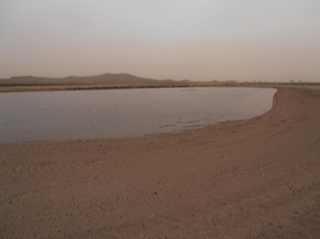 Having met the maintenance deadline including plowing and tilling the units again received water August 1st. 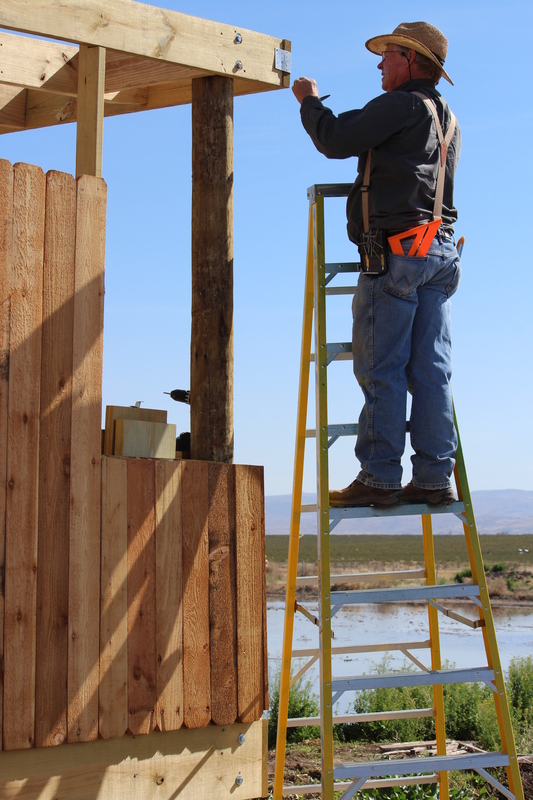 Dave Mainz aka “Thin Set” applying weather coating to bird blind. General clean up, brush & cattail removal. On Wednesday 20th July, 2016, a group of 22 high school students were given a tour of the Sandia Springs wetlands. 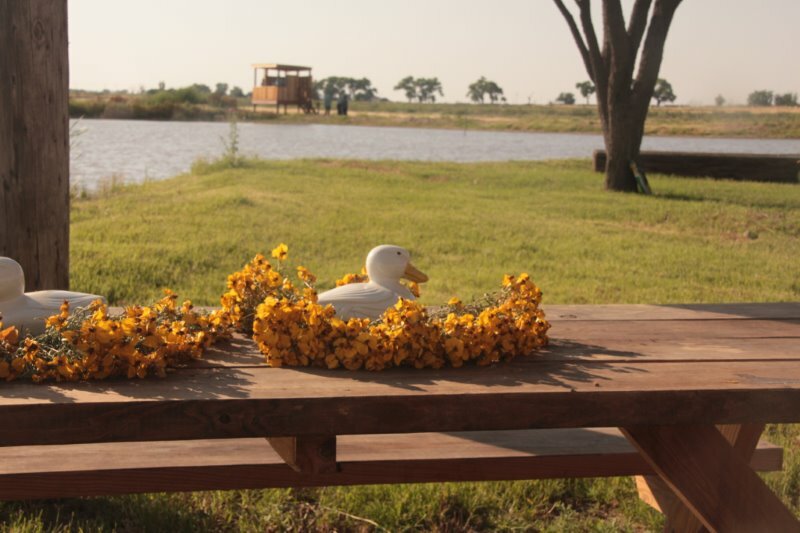 The students were there as part of the Wildlife Conservation Camp hosted by The Texas Chapter of The Wildlife Society. On this morning, students were given a lecture by Dr. Ryan O’Shaughnessy from the Borderlands Research Institute at Sul Ross State University. The lecture included discussion of wetland functions, timing of flooding and draw-downs, seed and invertebrate production, as well as information on management tools used in wetlands. After the initial talk, students were led around the periphery of the wetlands to examine the water-control feature currently being implemented at the Sandia Springs. The student showed great interest in the wetlands, and asked some meaningful and well thought questions. 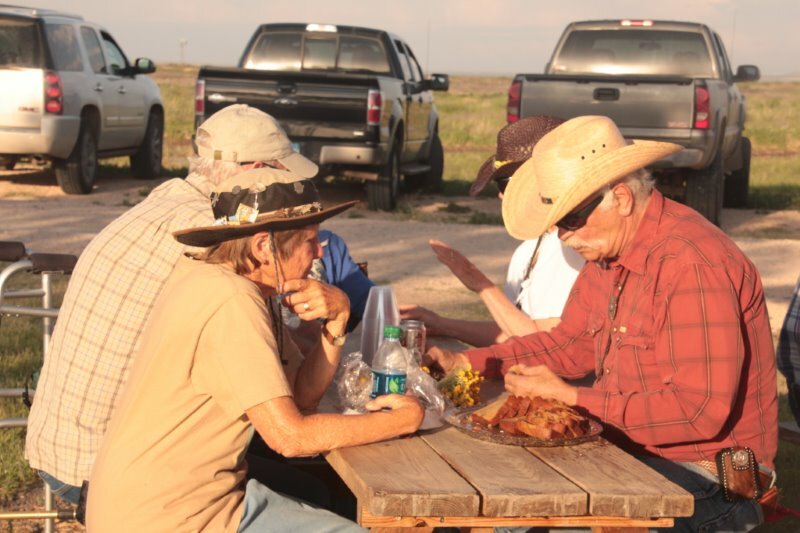 A good time was had by all, and the Wildlife Camp hopes to return to the Sandia Springs in the near future. 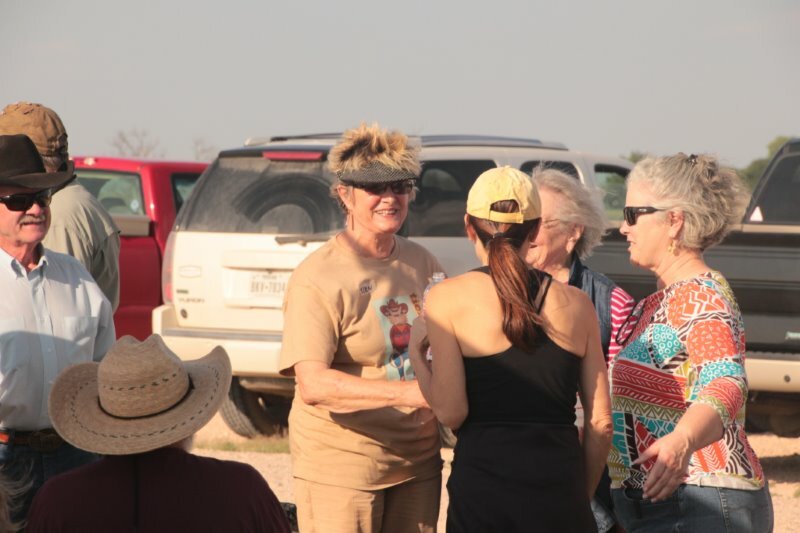 Ellen Weinacht Sandia Springs Wetlands property owner, sponsor and Tierra Grande member last weekend May 22nd hosted breakfast for the Advancement Board of Texas A&M University Press of which Ellen is a member. The TAMU Press has published works of folks very familiar to Tierra Grande Members and friends including Jackie Poole, Madge Lindsey, Dr. Louis Harveson and others. Credit to Dave Mainz for the images including those of White-faced Ibis. Yesterday, I was up at the Balmorhea area birding places and have some information you (and whoever) might like to have. Balmorhea Lake was very high and between the high water and the flooded access roads I found only a few ducks and only one Snow Goose. 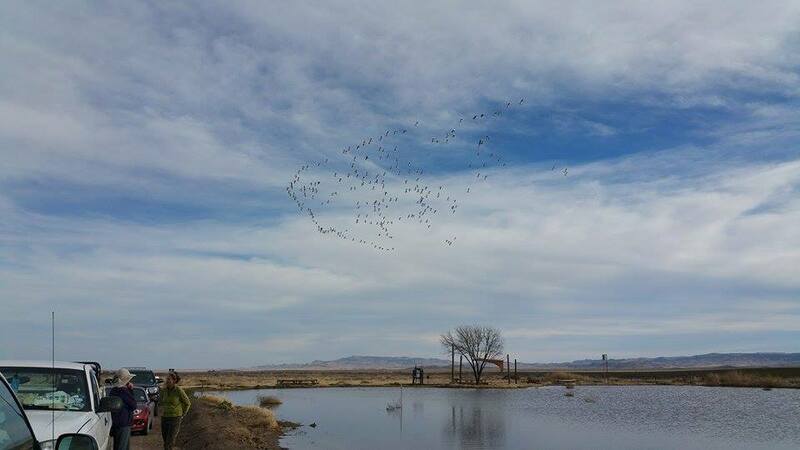 I drove over to Sandia and there were 62 Snow Geese including a half-dozen or so Blue Geese on the pond by the blind. Also a few shovelers, cinnamon teal and Mexican Ducks. I did not go into the wetlands as the geese seemed to be a bit jumpy about my presence. 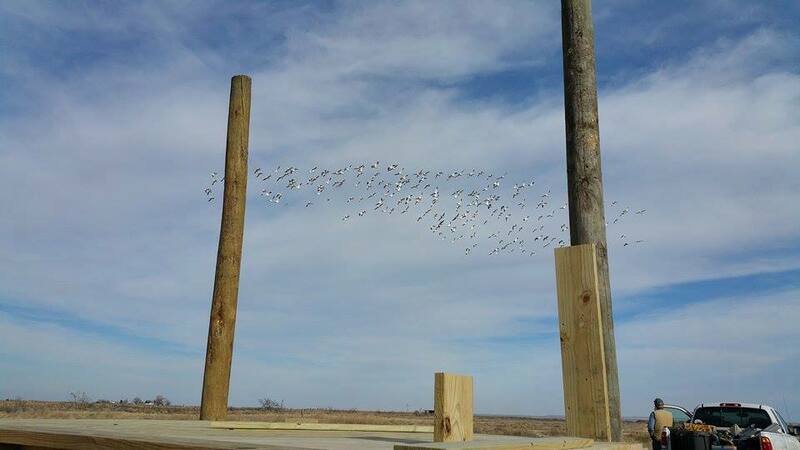 Did the Snow Geese move (of course)? The 2015 Christmas Bird Count list was provided by Mark Lockwood, Texas Parks & Wildlife Department. Lots of Birds. Ever wondered how the count got started and how the data is used today? Learn more by going to the following Audubon link. December 26, 2015 Boxing Day! 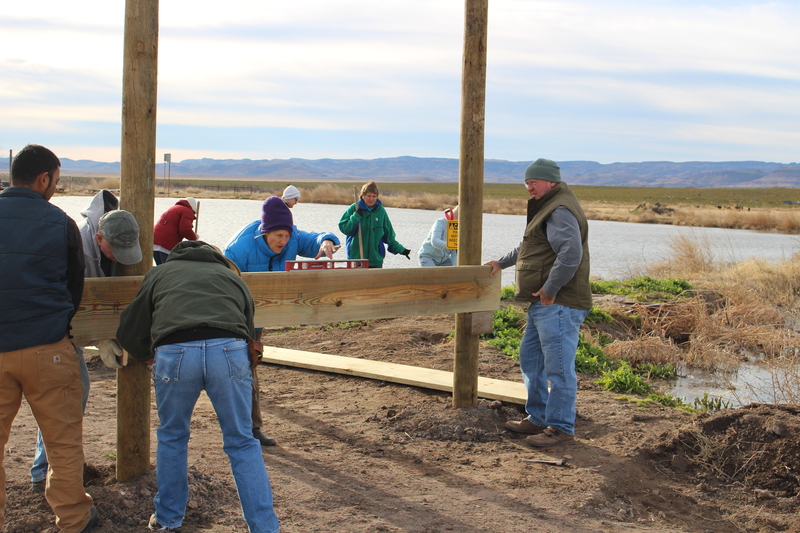 BOXING DAY DECEMBER 26, 2015 AT SANDIA SPRINGS WETLANDS! Lots of snow geese and ducks. 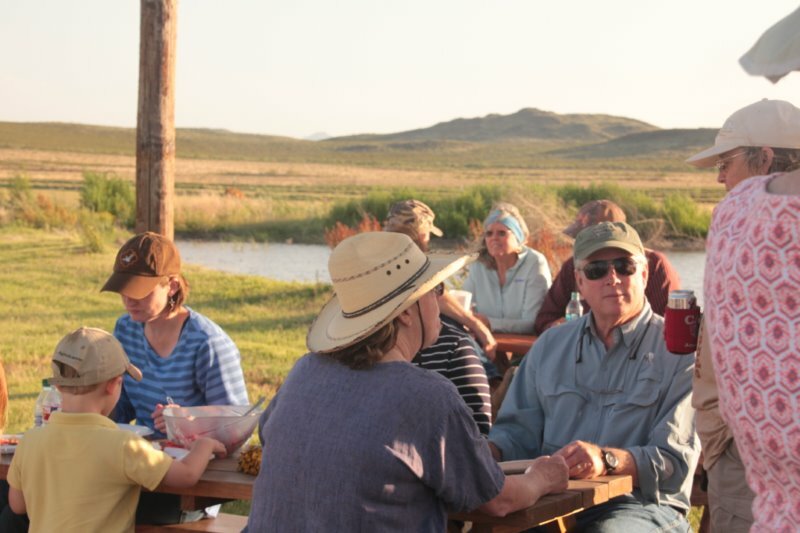 Ellen and Don Weinacht hosted the very first Sandia Wetlands “Hoedown”. 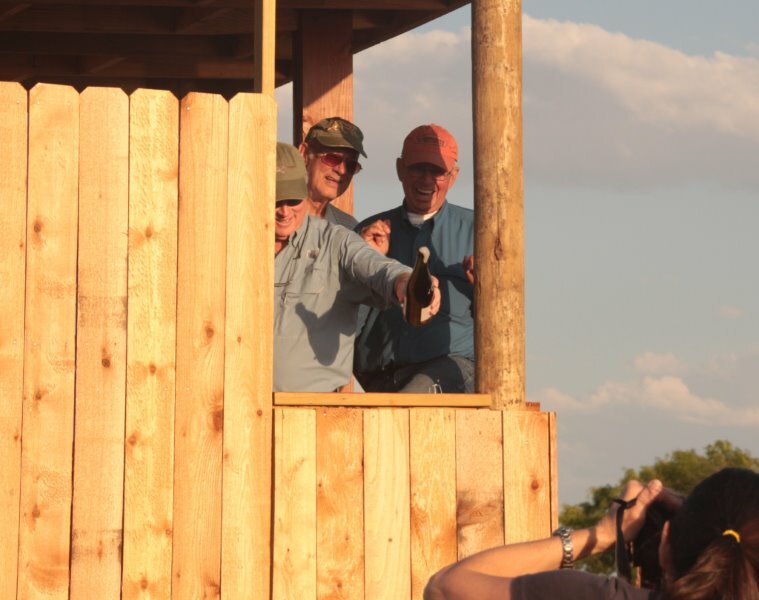 Friends, neighbors, dignitaries came from far and wide to enjoy BBQ, cold refreshments, make new acquaintances and renew old friendships and to honor the completion of the wetlands bird blind with a champagne dedication. A good time was had by all. Michael Carter, Dave Mainz & Dave Hedges. 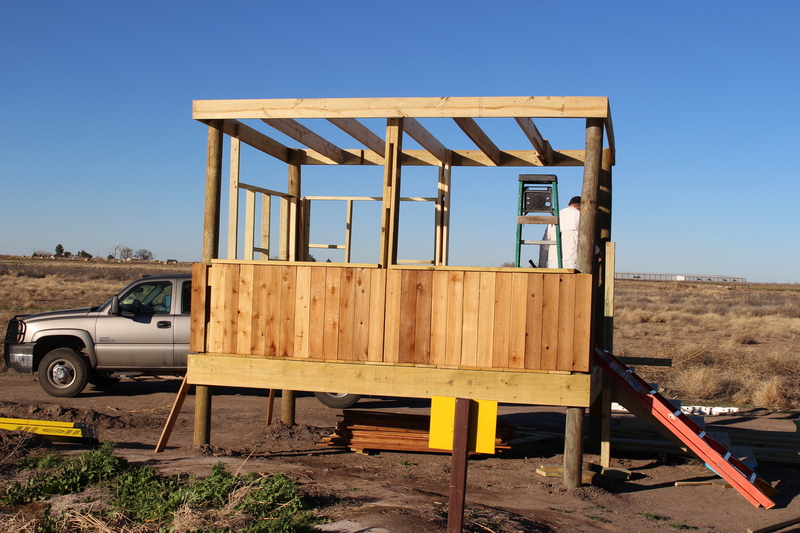 Ellen Weinacht and Dave Mainz added the finishing touches to the bird blind with an expertly applied seal coat on all the wood except for the cedar siding. The blind is open for business. SATURDAY JANUARY 17, 2015 – Fortunately Michael Carter was in charge otherwise we might still be out there. 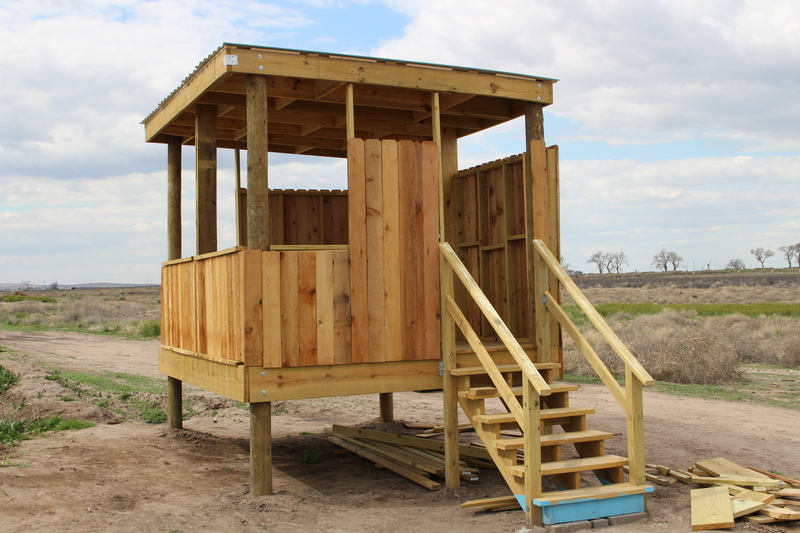 Michael designed the project, ordered materials and made sure we had the right equipment. This will be an ongoing project if you are interested in helping out. The first stage began yesterday Saturday, January 17th and will continue early next week. Half the flooring is complete. We had a great turn out. Ellen hosted potluck lunch. 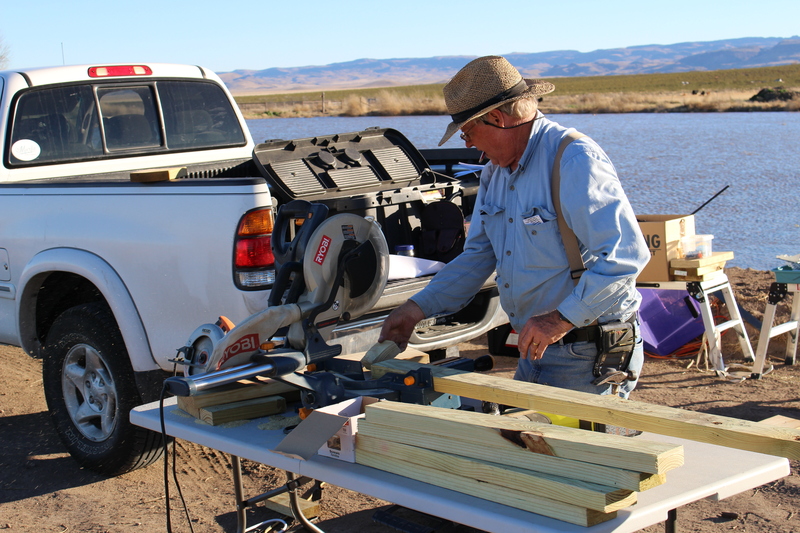 Other wetlands work was done as well including wetlands maintenance and the removal of unwanted plants, dried brush and tumbleweed. ANN SAYS SHE IS ON THE LEVEL. MICHAEL AND STEVE LOOK AMAZED. Work continued Tuesday January 20th. 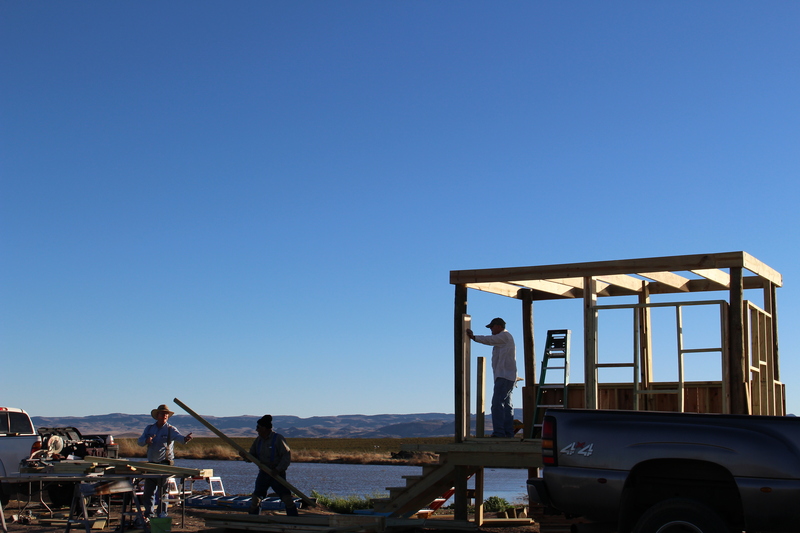 The deck was nearly completed, work began on the front wall facing the water. Topside Michael Carter, project manager. Below Abel and Dave Mainz. Work will continue to two weeks or so. The floor framing plan was abused. 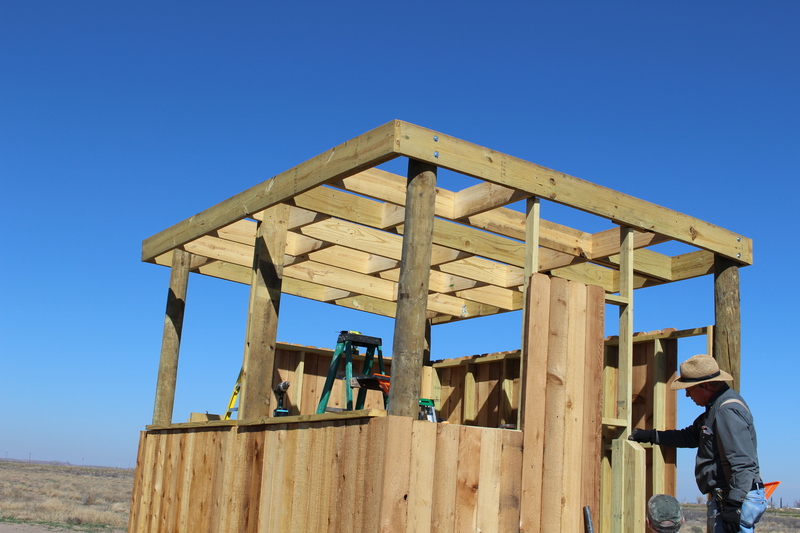 Work continued February 8 – Framing for roof and walls was nearly completed. 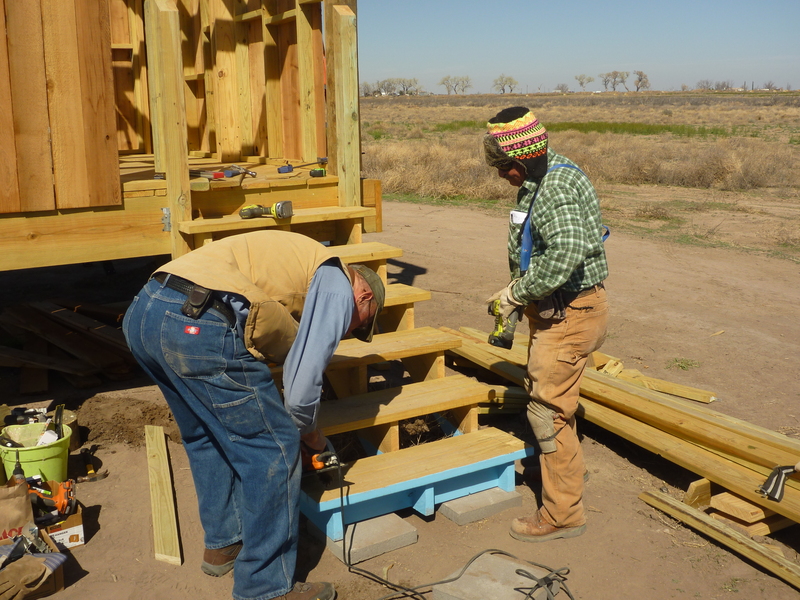 Michael’s prebuilt stairs were installed. Work to be continue later this week. Ryan Anthony is a M.S. 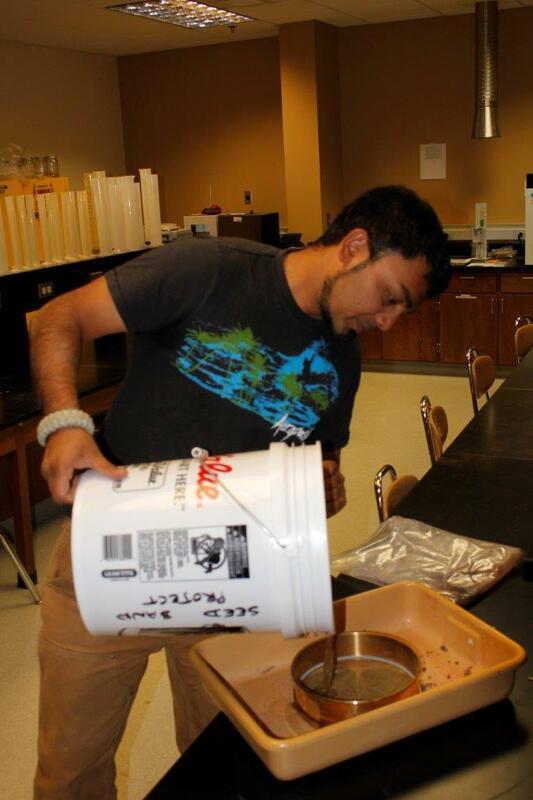 Thesis Candidate with Sul Ross State University’s Borderland Research Institute. 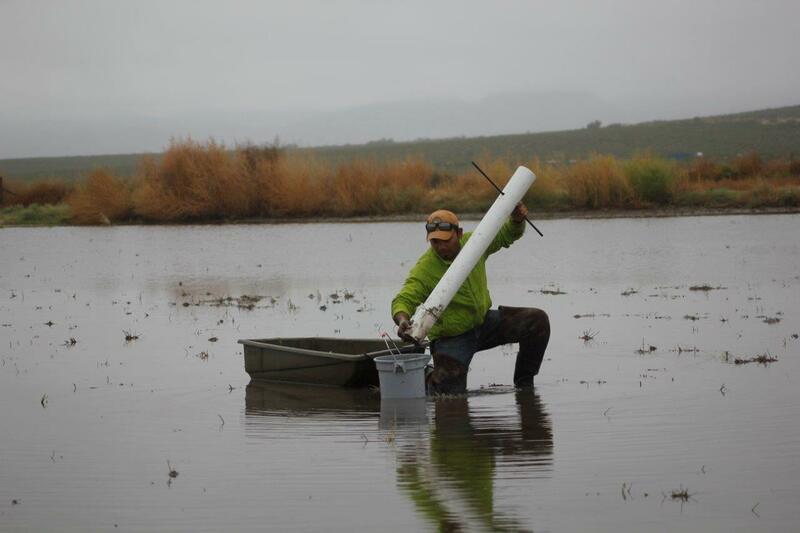 Along with other sites in the region Ryan is studying our project Sandia Wetlands, specifically crustaceans that provide food resources to the shorebirds and waterfowl during a high energy demanding migratory phase in their life cycles. Sandia is a unique small wetland with big potential as one of the only wetlands in this part of Texas. Ryan was born and raised in Pakistan. 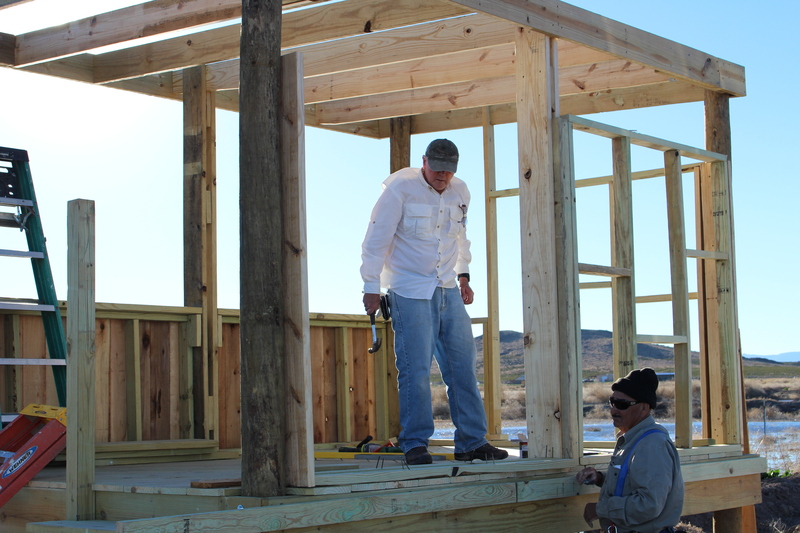 His home state is Arizona and is an Iraqi war veteran. In these images Ryan is taking sediment samples, the last image back in the BRI lab. Images taken by Bill Broyles, Texas Master Naturalist with Borderlands Research Institute. According to “Birds of the Trans-Pecos” author Kelly Bryan, the Marbled Godwit is listed as “Rare” – Seldom observed; may not occur each year during season indicated. 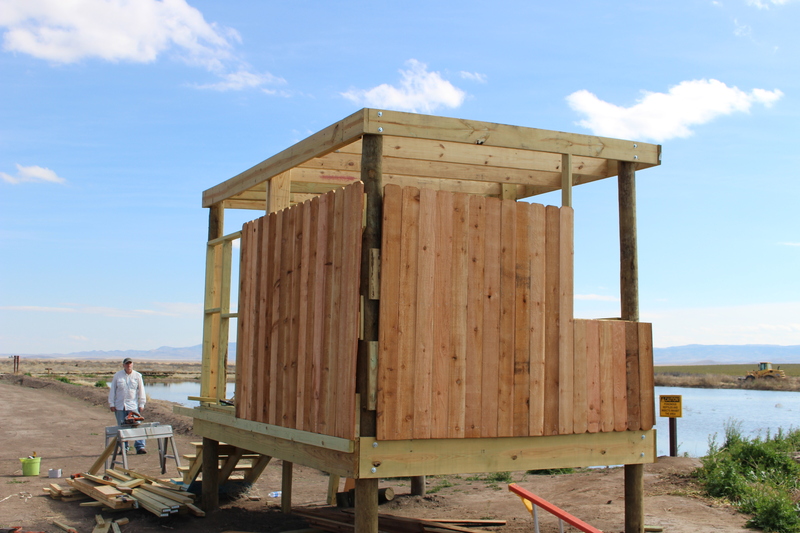 So if you are interested in a “rare” shorebird, the Sandia Wetland Project has produced it’s first. It was observed midday 04/21/12 in the center unit by Dave Hedges and Ellen Weinacht. Park in the parking area and approach the center unit quietly on foot from the north side. Binoculars will work fine but a scope will put him in your lap. This is a very large shorebird with a 30 inch wingspan and a large slightly upturned two tone bill. 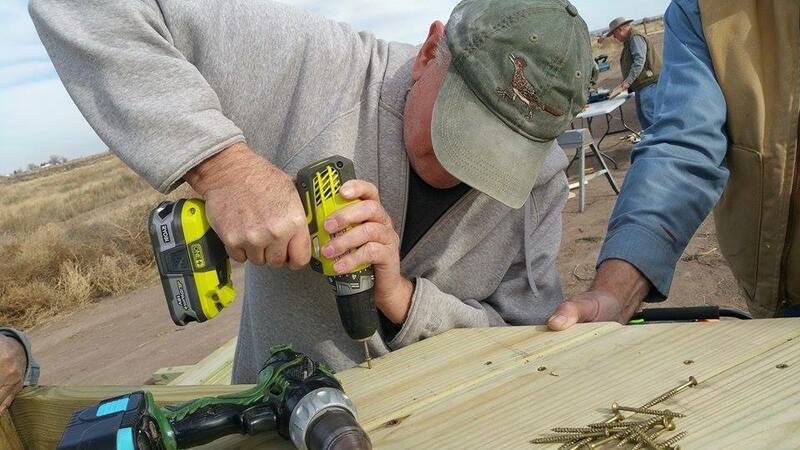 When probing for food one would think he’s drilling for oil. They go deep. A real thrill to have this occurrence on the Wetland. 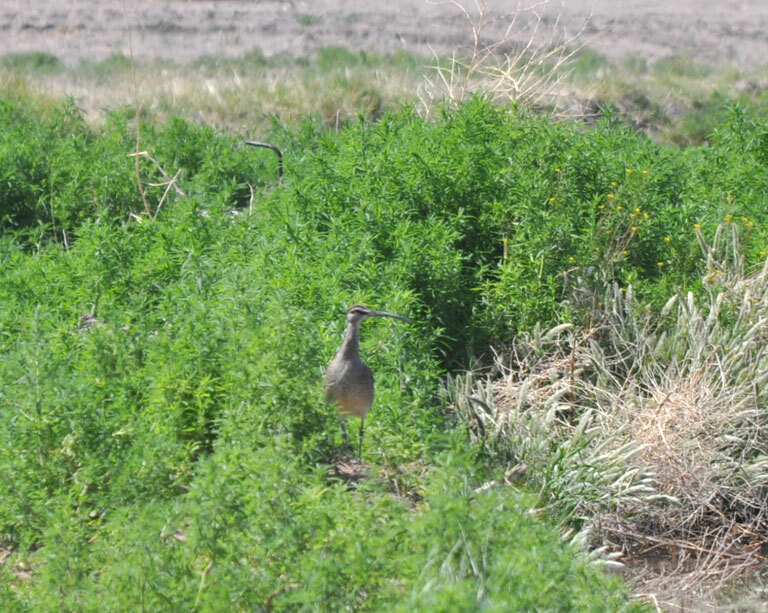 Today, Tues. April 24, 2012 GREAT NEWS—Report from Dave Hedges—Two extremely unusual bird sightings for our region have turned up at the newly restored Sandia Wetlands: Marbled Godwit (4/23) and today Whimbrel (4/24), Kelly Bryan informed that the Whimbrel is very unusual for here. 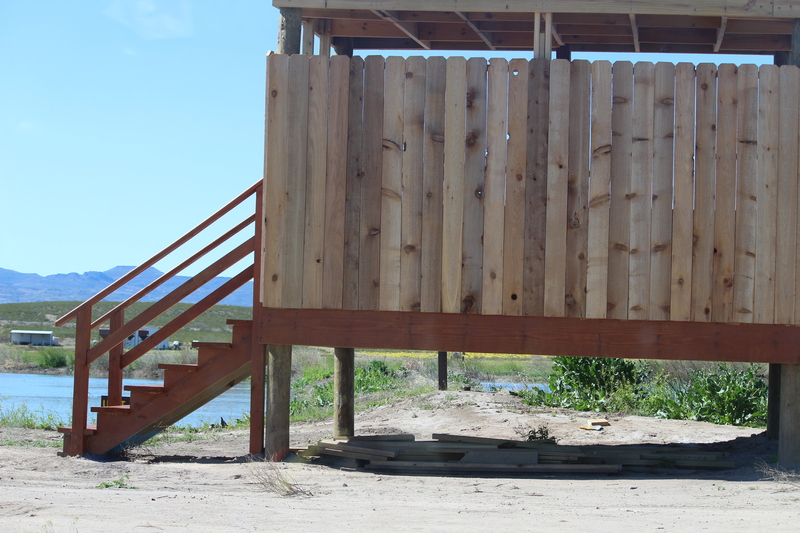 Also the newest unit added to the wetlands has water being delivered into it at this moment. They wetlands are doing what Dave and all of us predicted. Add water and species lost nearly 100 years ago will return. 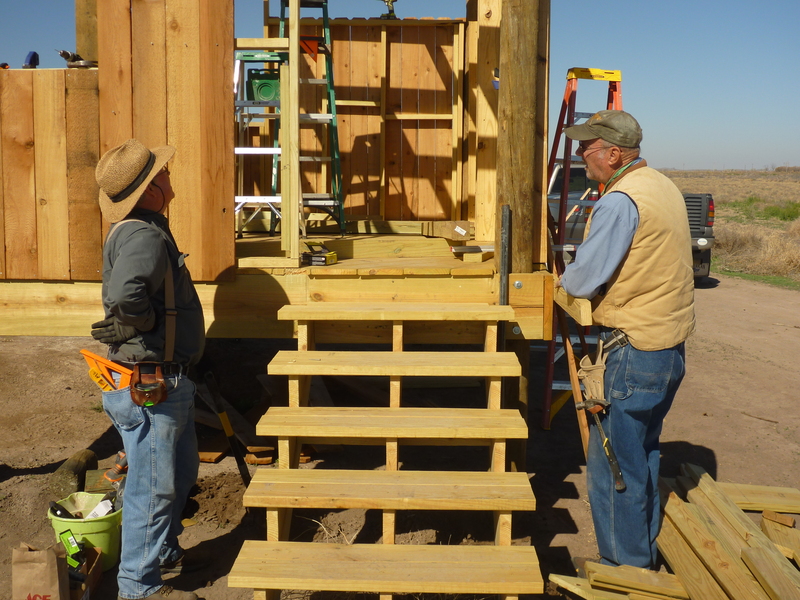 Steve Garcia the rock man, and his #1 assistant Billy Gallego watch the first water go into Unit 4. Unit 1 and Unit 4 are attracting shorebirds. Pickup by Unit 4 (which is the same size as Units 1-3) looking from the west. 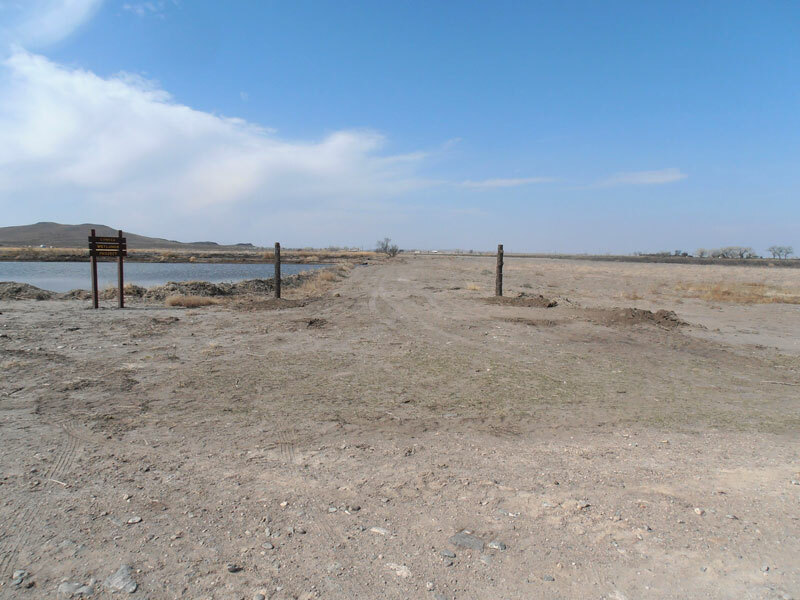 As you know, the 120 acre/feet of water from Lake Balmorhea to which The Nature Conservancy is entitled is currently dedicated to the Sandia Springs project. The project currently consists of 3 units covering a total of approximately 4 acres with another 2-acre unit proposed for the future. The project includes a parking and observation area adjacent to the county road for wildlife observers. Based upon my observations and the discussions of future plans for the project, I believe this to be a very good use of our water and very consistent with our mission, given the potential for migratory bird and other wildlife habitat, and especially in the context of historic wetland loss in our area. During my brief time there, I observed a lesser yellowlegs, white-crowned sparrows, killdeer, gadwalls, a Mexican mallard, and dragonflies. Please be aware that the TGMN committee for this project consisting of Ellen, Mary Fenton, Susan Penney, Barbara Novovitch, Mary Malmgrem, and others was very impressed with your recent recommendations regarding tree species and other vegetation. They plan to resume this planning in the near future and may be interested in calling on you again. If I can be of any help in this regard, please let me know. 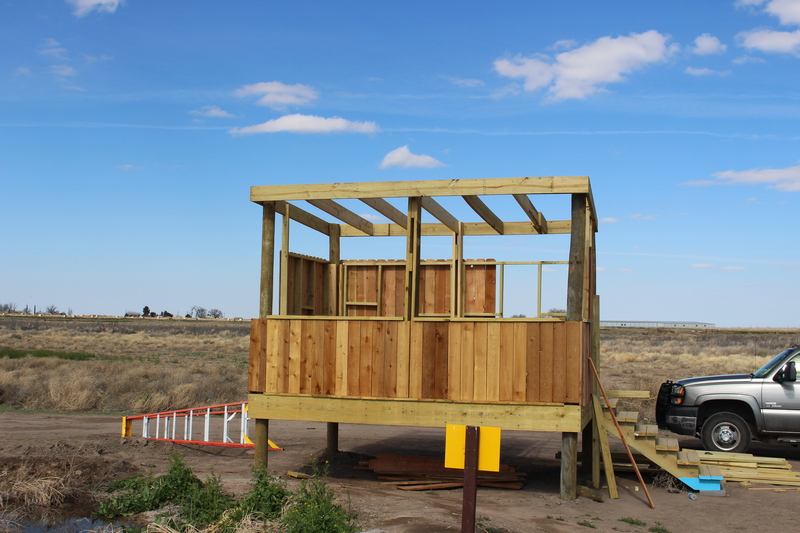 The 2 poles 6 ft apart in the middle are for the kiosk Dave M is building. 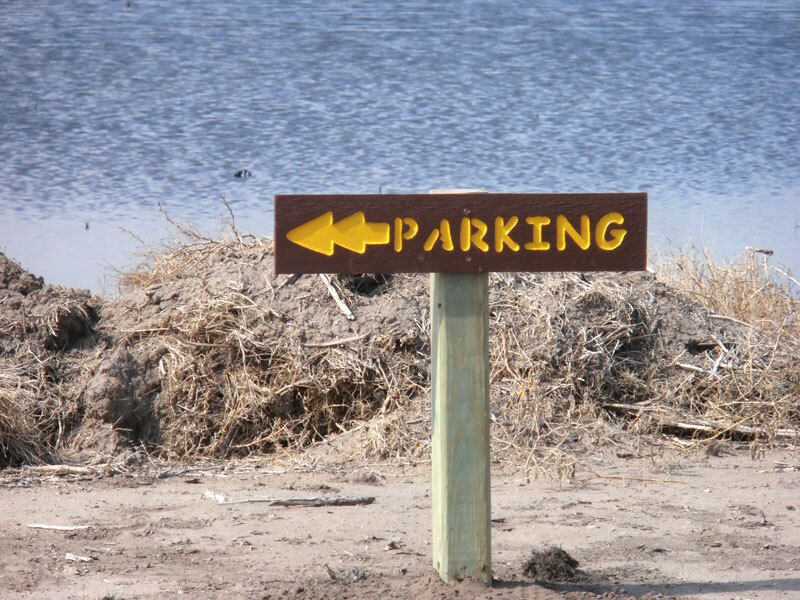 The two poles on either side of the side road are for a sign “No Vehicles” or a chain to prevent vehicles. 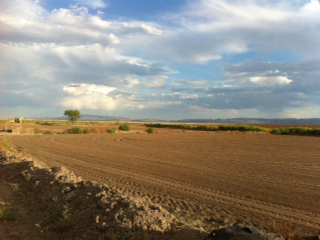 Yesterday the Sandia Wetland was leveled- bare to the bone. We will begin filling it this week and see what we attract.